Whatever the origin though the cupcake still remains one of the most popular drinks around. This cupcake pays homage to this drink and includes a chocolate and Coca-Cola cupcake, flavoured with a little rum. 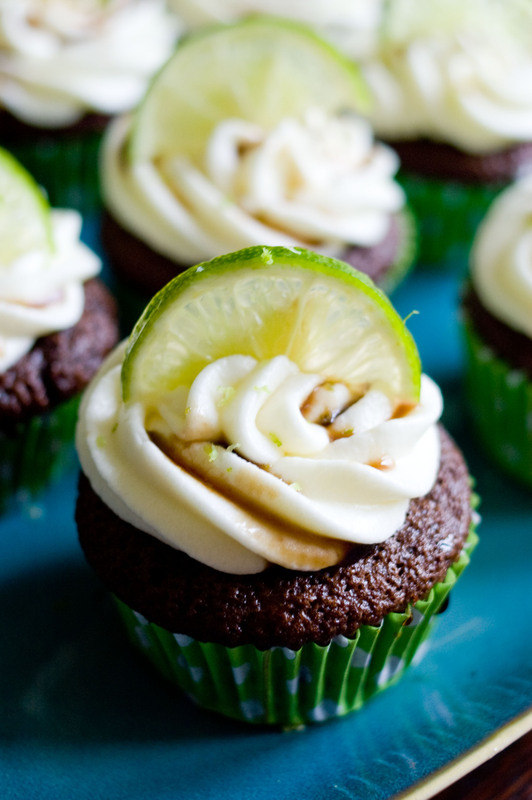 The cupcake is filled with a dark chocolate lime ganache and topped with a rum-flavoured buttercream. 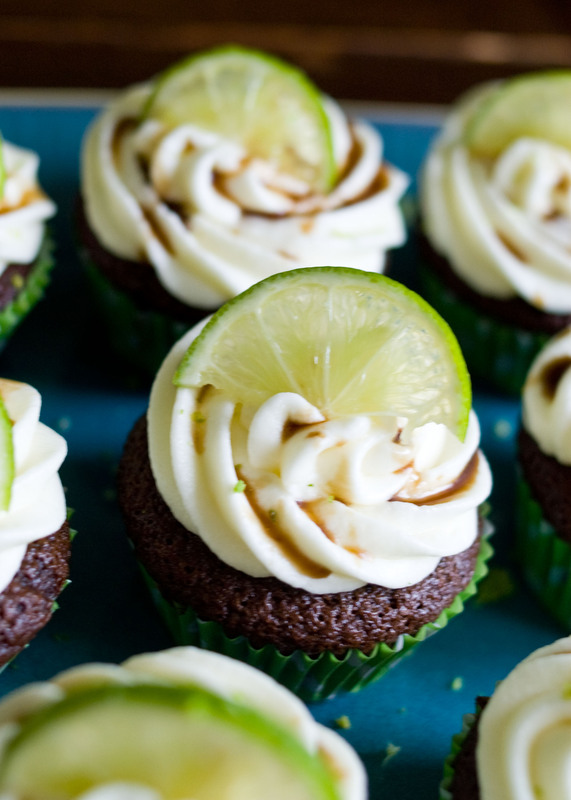 The cupcakes are then decorated with a Coca-Cola reduction and topped with a slice a lime and some lime zest. The cake recipe is taken from Coconut and Lime blog, from here. Preheat the oven to Gas Mark 5 and line a 12-hole tin with cupcakes liners. Melt the butter, Coca-Cola and Rum in a small pan and bring to the boil, before removing from the heat and allowing to cool. Mix the milk and the lime juice in a cup and leave for about 10 minutes – this will split and look disgusting, however it is correct, so trust me! Sift together the remaining dry ingredients and mix briefly before beating in the cooled butter/Coca-Cola/rum mixture. Beat in the egg and the milk mixture and mix to form a thin batter. Fill the cupcake cases to about 2/3rds full, and bake in the oven for 20 minutes, until an inserted toothpick comes out clean. Remove the cupcakes onto a wire baking rack and leave to cool completely. Make the chocolate ganache by heating the cream to nearly boiling point, and pour over the dark chocolate, stirring until melted and combined. Add the lime zest and leave to cool. Remove the centre of the cooled cupcakes using either a cupcake corer or a sharp knife, and spoon a little ganache into the centre of each cake. Make the buttercream by mixing the butter, icing sugar, milk and rum until light and fluffy – about 5 minutes with an electric mixture. If it is a little thin, then add in a little more icing sugar. Transfer to the piping bag and pipe onto your cupcakes, ensuring the ganache-filled centre is covered. Finally, reduce the Coca-Cola and sugar in the pan until it is thick and syrupy. Leave to cool and then drizzle over the top of your cupcake, before decorating with the slice of lime and the lime zest. Enjoy, preferably set outside with an actual Cuba Libre.